Hi! 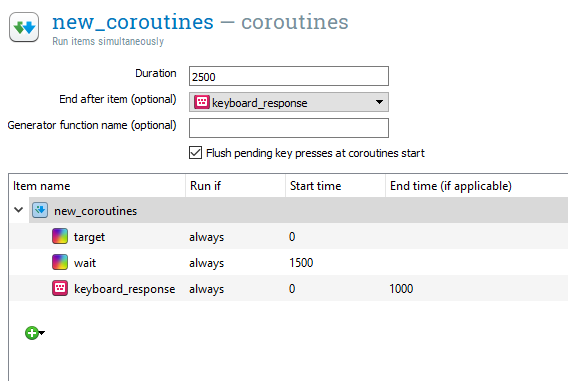 I am trying to use coroutines so participants will be able to respond over two sketchpad items. I just wanted to know if it should work, and if it should - what am I doing wrong. The way you've set it up now, keyboard_response is only active for the first 1000 ms. Since wait is only presented after 1500 ms, responses will indeed no longer be collected then. Do you see the logic? It's a very simple timeline, basically. Just to avoid confusion: if you also want to run the experiment online (with osweb), then the coroutines item is not supported either. and I'm so happy to hear that osweb is already working!! !